Hello readers! 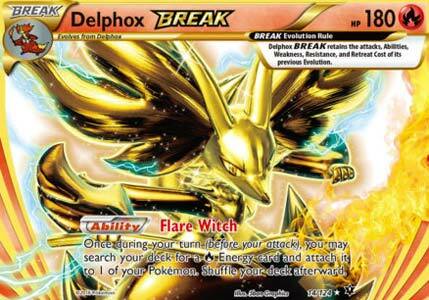 Vince here, and I’m looking at another card: Delphox BREAK (XY Fates Collide). Another late review from me, as the Pojo crew reviewed this card as their #9 best card of XY Fates Collide. I decided to review this card because I would hope that this Pokémon would shine due to most of the Metal support running amok in the Ultra Prism expansion. However, the typing alone may not be enough; you may need Field Blower to whack off Steel Frying Pans because that tool removes all weaknesses. Like every Break Evolutions, most of their attributes will be carried on and maintained such as Abilities, Attacks, Weakness, Resistance, and Retreat Cost. So far, all regular Stage 2 Delphox cards have 140 HP, weak to Water, and a retreat cost of two (whew, makes it far easier to shorten the length due to near-identical attributes). Break Evolving any Delphox cards bring the HP into 180, on par with EX/GX Pokemon, but bulkier due to Choice Band or any anti-EX/GX strategies not affecting Delphox BREAK. Probably the only Stage related counter I can think of would be Glaceon EX, whose Crystal Ray prevents damage taken from Evolved Pokemon. No matter what card is underneath the BREAK, she adds an ability called Flare Witch, which allows you to search your deck for a Fire Energy card and attach it to one of your Pokemon. This helps thinning your deck (not by much, but still), and provides additional energy attachments. 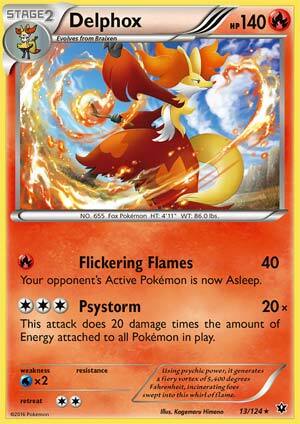 This ability stacks, so if you happen to have four Delphox BREAKs in play, you could get to search your deck for four fire energies. This ability is not that new, an ability with an similar effect originated from Chandelure (BW Plasma Freeze); Flare Navigate does the same thing, but you must put one damage counter on that Pokémon you decide to attach the fire energy from your deck to. Overall the ability is very good, but you might be wondering which Stage 2 Delphox cards that would be worth using. Well, there are only three versions of Stage 2 Delphox cards: XY Kalos Starter Set, XY Base Set, and XY Fates Collide. The XY Kalos Starter Set has two attacks. Will-o-wisp costs RC for 30 damage. Fire Blast costs RCCC for 120 damage and a forced single energy discard. This card is forgettable, unfortunately. XY Base Set has an ability and an attack. Mystical Fire lets you draw cards until you have six cards in your hand. Very good ability based draw that works every turn, unlike Shaymin-EX (EX Roaring Skies). Blaze Ball is a scalable attack, it costs CCC for 50 damage, plus 20 more for every Fire Energy attached to this Pokémon. If you meet the attack with RRR at a minimum, that’ll be 110 damage! Put in Choice Band or Muscle Band, and you’ll be OHKOing all Metal Pokemon weak to Fire, even ones with 250 HP. This card was the 4th best card of XY in Pojo.com. And finally, there’s the XY Fates Collide version. This one has two attacks. Flickering Flames costs R for 40 damage and puts the opponent’s Active Pokemon to sleep. This is good damage output with a status condition, for just a single energy; you may buy yourself a turn or two. Psystorm costs CCC and does 20 damage times the number of energy attached to all of your Pokemon. That is definitely the best attack of a Delphox card! Basic energy cards may count for 20 damage, but a Double Colorless Energy or a fulfilled Counter Energy actually counts as 40 damage due to having two units of energy. Against fire weak Pokemon, to reach OHKO territory, it’ll take a Choice Band and 5 units of energy to do 260 after weakness. Without weakness, you will need 11 energy and a Choice Band to OHKO anything. This card was the runner-up of XY Fates Collide’s top 10 list. 4: Launch a “medium move” via Blaze Ball. 5: Launch a “small move” via Flickering Flames. 1: Tapu Lele GX for consistency. 2: Drampa GX for being insanely splashable! 3: Keldeo EX & Float Stone for mobility! That’s what I can think of at the moment in terms of partners. Those can serve as an alternate placeholder until you get the entire evolutionary line rolling. In the end, Delphox BREAK is fun to use due to doing several things. Standard may not seem like much options left, but you can add Oranguru for draw power that’s half as effective than XY Delphox. Still better than nothing, and he can double up as an attacker with Psychic as well as sitting there with energy loaded. Dawn Wings Necrozma can act just like Keldeo EX while still needing a Float Stone to retreat for free. So there’s some similar partners that can take over in Standard while in Expanded you can choose either your old or new partners to perform the same task. No matter which format you’re in, you must watch out on Giratina XY Promo whose Devour Light shuts down all abilities from BREAK Evolutions, even the ones below the BREAK. In Limited, if you are able to pull the entire evolutionary line, your opponent would probably give up. Flickering Flames and Psystorm hits far harder in Limited than in other formats. Double Colorless Energy is in the set as well, so you can fuel up Psystorm much faster! However, you may have to wait at least three turns to evolve, and keeping them alive is not easy. Afterthought: This is one evolutionary line that can be considered a budget-friendly deck. The Break version costs around $1-$1.50 while the Fates Collide version costs around $0.50-$0.75 and the XY Base Set version costs $1. You can easily track down copies of those cards if you wish to use this. I hope you reconsider using this BREAK Evolution, even if this card didn’t make any tournament placings.